Website and processes: 23 Jan 16 Kate, 4/5 Good "Phoned with and enquiry which was answered and assured that my voucher would arrive the next day which gave me confidence to go ahead and order - look forward to receiving it nice to speak to a real human being and not a machine. 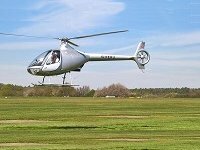 thanks "
Experience the thrills of a trial helicopter lesson in a Cabri G2 helicopter, with one of our experienced flight instructors. After the instructor has explained how the helicopter flies and what the controls do, under the careful guidance of the instructor, take to the air and experience the thrill of helicopter flight! Try going up and down, round in circles, hovering and looking at the local countryside. We provide a certificate of achievement after the flight. Suitable for people over 17 stone. Marlow, Buckinghamshire SL7 3DP .